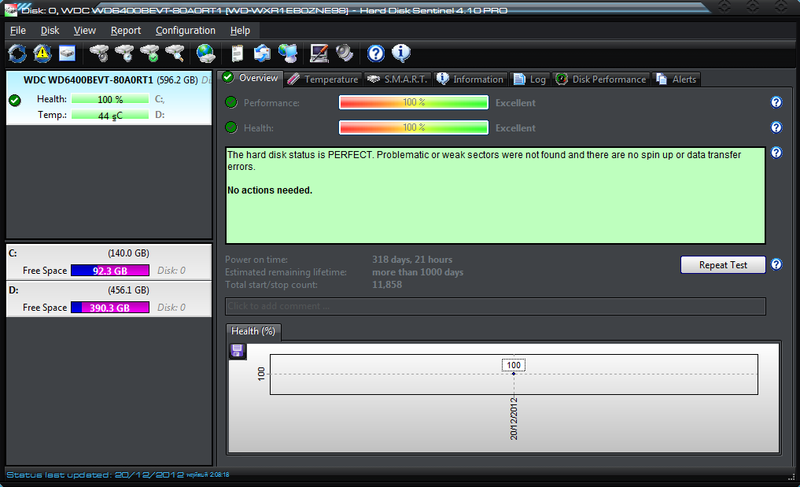 Hard Disk Sentinel is a HDD monitoring tool that will help you find possible hard disk problems, degradations, performance and failures. It can alert if a problem is detected or if temperature is too high and it has other reporting options. 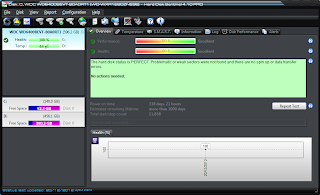 Hard Disk Sentinel can monitor hard disk status, including temperature and S.M.A.R.T. (Self-Monitoring, Analysis and Reporting Technology, built-in most hard disks today) values for each hard disk. Also it measures the hard disk transfer speed in real time which can be used as a benchmark or to detect possible hard disk failures, performance degradations. Hard Disk Sentinel can be used to prevent serious damage or data loss. It warns the user before a problem may occur and this gives them the opportunity to backup important and valuable data. - All information is displayed in the main window of the application. Quick controls allow easy navigation to access all hard disks, partitions and different information. Intuitive user interface elements display information by using green / yellow / red color to indicate the level of problem. Detailed text description and context sensitive help guides the user through the features and options. - Control Advanced Power Management level and adjust Free Fall Control sensitivity of hard disks to maximise hard disk performance and data safety. - Wide range of automatic backup methods are available: to backup data to local computer, to a LAN server or to a remote server by transferring files via FTP (or even by e-mail). It is possible to use 3rd party tools to create archives or burn CD/DVD media. Hard Disk Sentinel Professional can manage power status of remote computers in the network, so it is possible to automatically power on and shut down remote computers, for example a backup server. - With the API it is possible to query detected hard disk information from the software. This way 3rd party software can log, display or otherwise process detected disk information including temperature, health and so on. 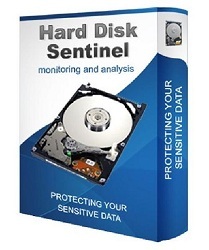 - Hard Disk Sentinel Professional offers extensive remote monitoring capabilities. Hard disk status can be checked remotely by a web browser, even by a mobile phone or a PDA. - Hard Disk Sentinel can communicate with IDE, Serial ATA, SCSI and most USB HDD and SSD to detect their status and temperature. 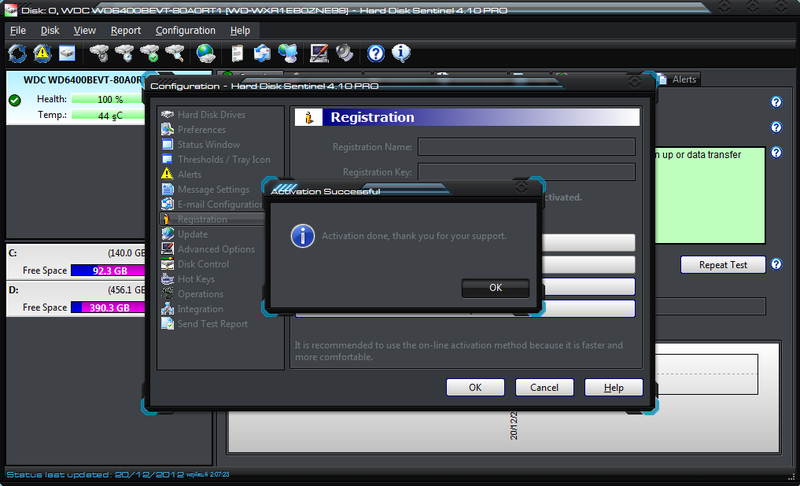 Disk status is displayed immediately as you launch the application, there is no need to analyse disks for a long period. - The app displays the current and maximum temperature for the hard disk. It reads all general and vendor-specific attributes and monitors their values. For advanced users, all raw data is displayed, including power-on time and number of read/write errors. - Hard Disk Sentinel interprets the performance and fitness related S.M.A.R.T. values and displays the calculated Performance and Health percentage, total power on time and estimated lifetime remaining. 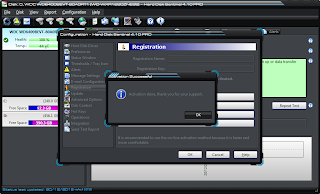 - By using Hard Disk Sentinel, it is possible to start hardware hard disk self tests. These tests can be used to effectively find all hard disk problems because built-in hardware methods are used to verify hard disk components (for example heads, servo, internal buffer in the Short self test). - The Extended self test also verifies the complete disk surface, finds and repairs all weak areas and re-allocates the possible bad sectors. This is not possible with the software-based disk surface scan methods (for example, by using scandisk). - Hard Disk Sentinel logs all degradations in all SMART parameters and issues alerts in such cases to maximise data protection. For example, if a new bad sector is found on your hard disk, you will be notified. - Hard Disk Sentinel has a wide range of alerts upon different problems. It can send e-mail (with e-mail->SMS gateway it can be SMS warning to your mobile), network message, can play sound alerts and so. It can execute various tasks (automatic panic backup or any configured external applications) in case of a problem. There is an option to send daily emails about current status. - View the current health status and used space in Windows Explorer or in any other application, so you'll always know the amount of used space for each partition and the disk condition. - Current hard disk temperatures and health are displyed on the system tray and can be displayed in a small status window, the desktop itself or in a sidebar gadget (under Windows Vista or newer operating system). Average and maximum temperatures are logged for all hard disks and this information is displayed in graphs for statistical purposes. - Logs how much data was read from or written to the hard disk. Displays current transfer rates for both reading and writing and estimates the maximum available (theoretical) transfer rate for a particular hard disk. - Hard disk with ATA or SCSI, SAS USB communication interface. - External disks (USB or IEEE 1394) are NOT supported.